You have prepared for months to take that trophy buck. After all that hard work are you going to trust your precious venison to a commercial butcher that mixes your quality meat with other gut shot, poorly field dressed deer? Get the satisfaction of processing your own game and ensuring quality meals throughout the year. You have prepared for months to take that trophy buck. After all that hard work are you going to trust your precious venison to a commercial butcher that mixes your quality meat with other gut shot, poorly field dressed deer? Get the satisfaction of processing your own game and ensuring quality meals throughout the year. If you currently butcher your game or are interested to start, the Outdoor Edge Game Processor is the highest quality and most complete portable butchering set available. Butchering game is easy plus with what a local butcher charges this set will pay for itself after your first deer. The Game Processor has everything you need to process big game, wild turkey, waterfowl, small game and fish. Each knife features full-tang construction for superior strength. Rubberized Kraton handles are ergonomically designed to reduce hand fatigue and ensure a positive grip even when wet. Each blade is taper ground for perfect balance and hand finished to a razors edge from high carbon 420 stainless steel. Ideal for skinning the trophy cape and performing detailed cuts with surgical precision. This classic blade style is perfect for skinning and long sweeping cuts. The most versatile butcher knife for deboning, separating large pieces of meat, removing silver skin and trimming jerky meat. A full-size blade for slicing steaks, carving roasts, turkeys and slicing paper thin strips of game jerky. Reshapes a razor sharp cutting edge in 10 seconds. Simply draw the Tungsten Carbide cutting blades over the knife?s edge 3-4 times and you are ready to go. The ultimate brisket spreader. Spreading the brisket allows easier access for removing internal organs and to ensures better air flow for quicker cooling of fresh game meat. Game Shears make easy work of clipping wings and legs off birds and quartering small game. Ideal to hold large pieces of meat and keep your hands clear of the cutting edge. Provides a large surface to keep meat clean, protects your cutting edge. Game cleaning gloves are included for easy clean up and safety. 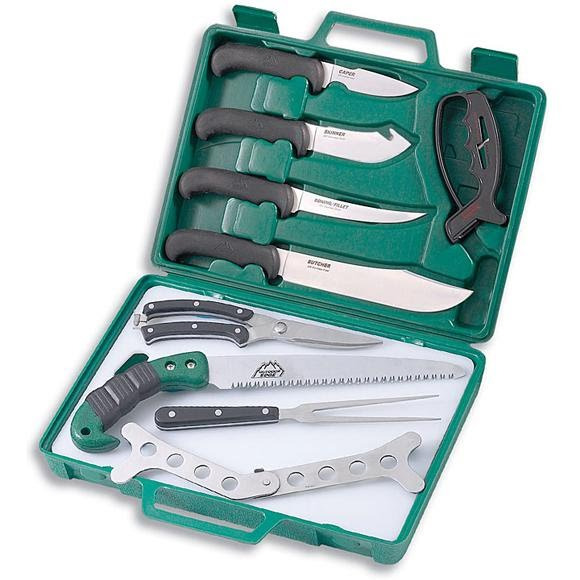 This complete set of quality tools stores in a durable hard side carry case with individual slots to hold each item securely. This full-size saw is a workhorse for quartering tough game bone and is as useful around camp for cutting wood.